In line with its aggressive infrastructure renewal programme to boost intra-African trade, the African Export-Import Bank (Afreximbank) on Thursday in Moscow signed a Memorandum of Understanding (MoU) with Russian Railways and the Russian Export Center (REC), agreeing to cooperate in implementing export and investment projects in the railway sector in Africa. The Spokesman of the Bank, Obi Emekekwue, who disclosed this in a statement said the terms of the MoU clearly states that the parties the deal will cooperate by undertaking mutual consultations on export and investment projects in the railway sector abroad and by jointly developing project financing schemes in the sector. 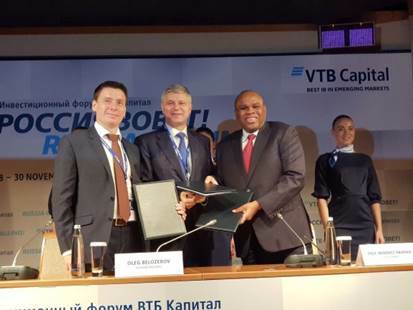 He added that the President of Afreximbank, Prof. Benedict Oramah signed the document on behalf of the Bank while Oleg Belozyorov, Director General of Russian Railways, and Andrey Slepnev, Director General of REC, signed for their respective organisations. According to Emekekwue, the Afreximbank boss, Oramah, while speaking after the signing, cited the huge demand for infrastructure in Africa and said that the continent needed investments of $20 billion per annum in the rail sector in order to bring it up to required level. “Oramah said that Afreximbank’s role as to find partners that would help it to deliver the necessary investment in Africa. The signing of the MoU would enable Russia to begin to participate in the opportunities that existed in Africa”, he added. Emekekwue also quoted Andrey Slepnev as describing the signing of the MoU as a demonstration of practical collaboration among the institutions and expressed confidence that it would bear fruit. “Russian Railways is reputed for developing and advancing technologies and techniques for effectively managing railway systems”, the Afreximbank Spokesman added.